Northland's Shining Jewel. Come stay and play at Kai Iwi Lakes, Taharoa Domain, one of New Zealand's best holiday spots. Only 3 hours from Auckland, 35 kilometres from Dargaville. Nestled amongst 538 hectares of premier recreation reserve with white sand freshwater dune lakes renowned for their jewel-like beauty and clear waters. Perfect for a wonderful camping experience with the choice of two camp grounds located on lake foreshore, both offering an ideal camping experience for tents, caravans or motorhomes. Pine Beach has camp sites, wash and shower facilities, two flushing toilet blocks, playground and summer seasonal services, including mobile shop and camp staff located onsite. Promenade Point has camping areas, a new toilet block however no shower facilities, and is true relaxed kiwiana camping experience. There is a strict no pets and dogs policy to protect the native wildlife. The Taharoa Domain reserve's beautiful crystal clear Kai Iwi Lakes are ideal for safe swimming, kayaking, fishing, boating and water skiing. Explore and enjoy bush and open country walking tracks with native wildlife and revegetation programme making this a premier Northland reserve close to surf beaches, Waipoua Forest and other Kauri Coast and Northland attractions. Kaipara District Council would like to thank Ross Archer from Playco and Joe Moores from Commercial Play Systems for their Proposal and their support for establishing the new playground at the Kai Iwi Lakes camp ground. Without this, the wonderful playground for the children to enjoy would not have been possible. The Kai Iwi Lakes are basin type dune lakes formed in consolidated sand of late Pleistocene geological origin. They were formed by the accumulation of rainwater in depressions of sand underlain by relatively impermeable ironstone pans. Dune lakes are one of nine major lake types found in New Zealand and are the predominant type found along the west coast of the North Island. Lake Taharoa which covers 237ha is the third largest dune lake in New Zealand. Lake Waikere cover 35ha and Lake Kai Iwi 33ha. Together the three lakes occupy well over half the total area of the domain. Lake Kai Iwi and Taharoa are connected by a narrow channel and are about 70 metres above sea level. 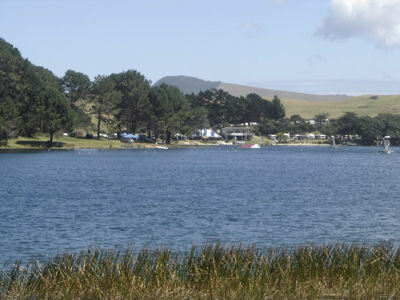 Lake Waikere is more elevated and about 79 metres above sea level. Lakes Taharoa and Waikere are the deepest known dune lakes in the country. The NZ Oceanographic Institute bathymetric chart of lakes record the maximum depth of Lake Taharoa to the 37 metres, and Lake Waikere 30 metres. Lake Kai Iwi is considerably shallower than the other two lakes and has a maximum recorded depth of 16 metres. The Kai Iwi Lakes have no known natural inlets or outlets. Their principal source of water is likely to be rain which falls directly onto the lake surface. As a result their levels fluctuate considerably with climatic conditions. Seasonal lake level movements of 400-600 mm have been recorded on Lake Taharoa. Lake water temperatures also vary considerably during the year. Temperatures of 12.8°c to 21.0°c have been recorded. Thermal stratification sometimes occurs during the summer with the formation of distinct water layers of different temperatures.